Hidrostal, the original inventer of the Fish Friendly pump, has supplied pumps for Whitacre Heath pumping station to make it fully compliant with the Eels regulations. The regulations were brought into effect to tackle the rapid decline in global populations of the European eel. In order to breed eels must return to their migration grounds, in Europe a distance of approximately 6500 km, to the Sargasso Sea. Obstructions which impede their journey, such as pumping stations, may be a contributing factor in their fall in numbers. Hidrostal’s pumps were originally developed and patented in the 1960s for use in the fisheries industry. The pump was invented by the company founder, Martin Stähle, to transfer fresh fish from a boat with minimal damage, therefore guaranteeing the quality and appearance of the fish for market. Whitacre Heath pumping station was updated by Integrated Water Services (IWS) for the Environment Agency to provide the sustainable management of flood risk to people, properties and infrastructure in Whitacre Heath. The pumping station is located on a stream that feeds into the river Tame over a distance of ¾ mile. 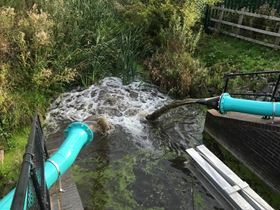 Whitacre Heath pumping station was flagged up by the EA as having an Eel & Fish Friendly requirement with which the previously installed pump did not comply. Investigation of the original installation showed a 200 mm diameter rising main. At the required flowrate of 100 l/s this gave a velocity of 3.1m/s which is too high for Eel & Fish Friendly operation. The EA and IWS were required to increase the rising main diameter to 250 mm, along with the installation of Hidrostal Fish Friendly pumps in order to make the station compliant. Hidrostal supplied two Fish Friendly pumps which were installed into the existing installation, delivering the exact same duty of 100 litres per second at 5 m total head. The new pumps are called into use at periods of very high rainfall, when the stream flow is isolated by penstocks to both reduce water levels up stream and reduce flood risk to several properties. When the penstocks are closed this causes the level to rise, so the pumps will then be used to transfer the water to the downstream side of the penstocks and away from the properties. Bedford Pumps and Hidrostal Ltd are launching their new Fish Friendly website. Pumps with a solids handling capability were required to ensure successful operation. Crossrail is the new railway for London and the South East of England.